This entry was posted in mental illness, psychology and tagged communication, depression, emotion, language, people, sadness by Miri. Bookmark the permalink. I appreciate your many posts regarding mental illness, especially your general point that it is nearly impossible to understand how someone with a mental illness feels unless you have actually “been there, done that”. So many people don’t understand this concept–I know I didn’t until I experienced an episode of major depressive disorder. I appreciate your posts too! I know what depression feels like. I know how it hurts. I know how it washes away the full ability to smile or be cheery. People who are depressed already know/feel like they are ‘bringing others down’. When I feel like this my friend tries to cheer me up by arguing with me about all the positive things I don’t see. It actually makes me angry and frustrated when she does this. I’m not looking for someone to disagree with my misery – my misery is real. I don’t need yet another reminder that I’m all alone inside. It doesn’t usually make me feel better, although occasionally it does help to remember that the way I am seeing things isn’t the whole picture. Mostly what I think can be useful, compassionate, and even a defense from those who feel brought down by a debbie downer, can just be to listen for a few minutes, ask why they feel that way, nod, and just accept it. That alone can really help, and sometimes once a person simply feels heard, they themselves lighten up a bit. On the other hand, depression also involves “self-talk” in which a person reaffirms their own negative view by the way they talk to themselves about themselves and their lives. I have a friend like this and a simple question gets a very negative answer. I think in part she does so because of the positive reinforcement she gets from people cooing over all her ailments and such. I think we can try to choose our moods – to a limited extent. But also our moods are often contagious, infectious, and we do have a responsibility to ourselves and to others to be contagious in a spirit-lifting way. Smiles. Somewhere between miserable Debbie Downer and Stepword Wife “always be positive!” lunacy. My mother always told me “quit being so negative!” “you’re so negative!” and I wish she had stopped to wonder what she was doing to me as a child that made me feel so deeply dark inside. Hope you are having a happy holiday! I’ve experienced alienation due to my ‘debbie downsmanship’. People’s dismissiveness can be really harmful. Personally, it’s as if my feelings are invalid and unreasonable. Ugh. Thanks for this appeal. Here’s another reason to get rid of the phrase – it makes us Debbie’s uncomfortable (or at least this Debbie). The name Debra means Industrious Bee. 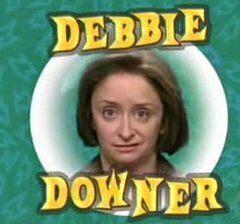 While the whole SNL skit was funny, the overly used phrase (often while Debbie’s are in a room) creates a connotation and a stereotype that no one deserves. Same with other names (ie Steady Eddie, Negative Nancy, etc).